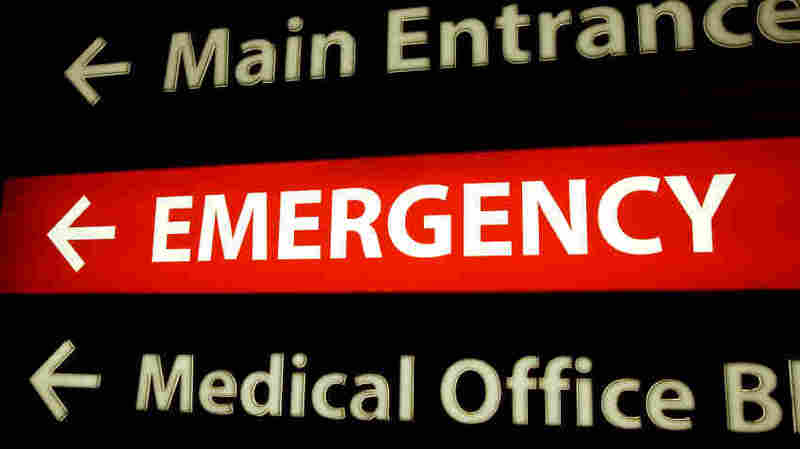 Medicaid Expansion Boosted Emergency Room Visits In Oregon : Shots - Health News If people have insurance coverage, the theory went, they won't end up in the emergency room as often. But an analysis of Oregon's expansion of Medicaid found that people who gained coverage were 40 percent more likely to go to the emergency room. But a study published in the journal Science on Thursday finds that's not the case. When you give people Medicaid, it seems they use both more primary care and more emergency room services. "Medicaid coverage increases emergency department use, both overall and for a broad range of types of visits, conditions, and subpopulations," says Amy Finkelstein, an economics professor at MIT and one of the authors of the study. "Including visits for conditions that may be most readily treatable in primary care settings." In other words, people are going to the emergency department for things that aren't emergencies. This is exactly what policymakers hoped to avoid by giving people health insurance – including the huge increase in Medicaid coverage coming as part of the Affordable Care Act. And the increase in ER use found in the study was significant – "about 40 percent," Finkelstein said. This would be a good place to point out this is not just any study. It is the third major paper from something called the Oregon Health Insurance Experiment, which Finkelstein heads along with Katherine Baicker from the Harvard School of Public Health. The experiment was a rare opportunity to create a randomized controlled experiment – the gold standard of scientific research. It came about almost by accident, thanks to Oregon's decision in 2008 to expand its Medicaid program via a lottery. The result, said Finkelstein, was that the groups of people with or without insurance were identical, "except for the fact that some have insurance and some don't. You've literally randomized the allocation of insurance coverage." And that gave researchers the ability to compare the effects of having health insurance — in this case, Medicaid. The first paper from the research team, published in 2011, was mostly positive. It found that people who got Medicaid coverage were more likely to use health services in general, less likely to suffer from depression, and less likely to suffer financial problems related to medical bills than those who remained uninsured. The results in the second paper, published last spring, were more equivocal. Researchers found no measurable health benefits in the Medicaid group for several chronic conditions, including hypertension, high cholesterol and diabetes. It's not clear that the emergency room results will translate nationwide: The study only lasted 18 months and the study population is both more while and more urban than the rest of the nation. But that's not stopping critics of Medicaid expansion. "When you make ER care free to people, they consume more of it. They consume 40 percent more of it," says Michael Cannon, head of health policy for the libertarian Cato Institute. "Even as they're consuming more preventive care. And so one of the main arguments for how Obamacare was going to reduce health care costs is just flat out false." Cannon says the study will likely further hurt President Obama's credibility for vowing that expanding Medicaid would help get people out of emergency rooms. But what's likely to bother the administration even more, he says, is what it may do to the half of the states that have yet to adopt the Medicaid expansion. "This study is going to make it less likely that the 25 states that decided not to expand Medicaid are going to change their minds and decide to expand Medicaid," Cannon predicts. But this study doesn't come as much of a surprise to those people who actually run Medicaid programs around the country. "This is not something that is unexpected and not something that we're not prepared for," says Kathleen Nolan. She's director of state policy and programs for the National Association of Medicaid Directors. Nolan says most states are already working to help Medicaid recipients get care in more appropriate settings. "Things like nurse-advice lines, trying to work with the community clinics and community providers to expand hours and make sure that people who are working two and three jobs can get access to primary care after hours and on the weekends," she said. Because Medicaid recipients are by definition low income, Medicaid doesn't use higher patient payments to deter emergency room use like many private insurers do, Nolan says. But the key to getting inappropriate costs down for all patients, she says, is educating people about where they should go when it's not an emergency.